Acrylic Colour is water-based and so not only dries much faster than Oil Colour but can also be cleaned and diluted with water. Acrylic should be your choice if you’re looking to produce a finished piece in one session or to work in several layers without a delay. Like Oil it’s most commonly applied to Canvas or linen, but you can also use it on paper. To accompany Acrylic colour, there are a wide range of Acrylic Mediums, Gels, Pastes and Additives, which fall beneath the umbrella of Acrylic Mediums. These offer artists infinite control of changing the working characteristics and behaviour of acrylic colours. They range in consistency from pourable to moldable. They may be used to create glazes, extend paints, build-texture, change finishes or work as a gluing agent for collages. Because there are so many to choose from, an artist first needs to determine which characteristic(s) they are looking to change. All Acrylic gels, pastes and mediums can also act as a general adhesive in collage and mixed media work and they will dry to form continuous films with excellent flexibility with chemical, water and UV resistance. Acrylic gels can be thought of as colorless paint, as they are composed of 100% acrylic polymers similar to acrylic paint, but remember they can vary greatly in consistency and in how they behave. They can be used to increase the transparency of acrylic, increase or reduce thickness (viscosity), build layers, alter sheen, create resinous effects or enable acrylics to be heat set on fabric. Acrylic mediums are generally thinner when compared to gels and this makes them ideal for glazing. Acrylic mediums can also be used for blending, increasing or reducing gloss, increasing transparency, extending colours, promote both flow and leveling of acrylic upon a surface. Acrylic Pastes differ from most gels in that they are opaque and may contain Marble Dust, Diatomaceous Earth, fibers, clays or other fillers resulting in a white or clay-tone finish with a variety of textures and properties. Pastes can also be used to create various textured foundations for painting. Acrylic Additives are used to alter the characteristics of how paint behaves in use but must be used in moderation. For example two of the most popular would be Acrylic Retarder (or Slow Drying Medium) and Acrylic Flow Release. 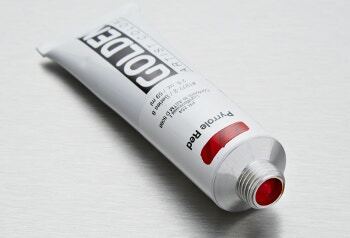 Retarder or Slow Drying Medium can be mixed and used to increase the drying time of water based paints and is particularly useful for blending, wet on wet techniques or preventing colours to dry on the palette. Acrylic Flow Release can be used for improving the flow of brush strokes or deepening staining effects. It is advised Acrylic Flow Release is used 1 part to 10-20 parts water as it is very concentrated.